Herbs and spices can either make or break a recipe. Learning how to use them is essential for any good cook, but that can be a little tricky. Not only is there an infinite number of herbs and spices to choose from, each one seems to come with its own set of rules. What's the difference between a herb and a spice? Both come from plants, but they come from different parts of the plant. While a herb originates from the green, leafy part of the plant; spices can arise from the root, stem, seed, fruit, flower, or bark of a tree or plant. Cilantro is an excellent example of this because while cilantro (a herb) is the leaf of a Coriandrum sativum plant, coriander (a spice) is the seed that comes from that same plant. When it comes to fresh herbs versus dried, whole spices versus ground, organic, GMO, non-GMO, etc., the entire thing can get a bit overwhelming. While most people are comfortable using basic seasonings; salt and pepper; maybe a couple of varieties of seasoned salt; garlic powder; possibly even a little onion powder. Not everyone knows what to do with Turmeric. Or Sage. Or Coriander. Or Marjoram. Sometimes trying out a recipe means using a new herb or spice that you don't have, so you buy it. But then, sadly for most (because that stuff isn't cheap), it sits in your cupboard, forever. 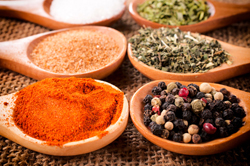 You should know that all herbs and spices have an expiration date. Yep. Check that bottle before you toss another heaping teaspoon into a recipe. It might have lost its pizzazz! Most expire within about a year from purchase. While we'd like to think we know a thing or two when it comes to herbs and spices, we ran across a list for the most Common Culinary Herbs and Spices on VegKitchen, and think they did a bang-up job! So before you toss out that cardamom because you can't remember what you bought it for, check out the link above! For a complete list of basic herbs to the most exotic seeds and chilie check out The Encyclopedia of Spices and Herbs: An Essential Guide to the Flavors of the World .